The agricultural production and food supply systems of a country depend on many factors including government policy, ecological potential, and the level of technology, inputs and skills of the agricultural producers. Food self-sufficiency has been a food policy objective of many African governments. However, while this objective may have been politically desirable, it has not always been economically and ecologically feasible. In some countries food self-sufficiency has been taken to mean adequacy of food supplies of locally produced staple cereals (e.g. maize, sorghum, rice) to meet the population's per caput energy requirements, but more often it has been seen as adequacy to meet market demand. Foods other than staple crops may be included, but in all cases the concept is that countries would not need to import foods or would minimize dependence on food imports as far as possible. While a certain degree of food security can be obtained with such an approach, especially in remote areas with risky or unstable markets or in those lacking markets, a strict policy of food self-sufficiency is generally not desirable. By contrast, the concept of food self-reliance takes into account the possibility of international trade. It implies maintenance of a level of domestic production plus a capacity to import in order to meet the food needs of the population by exporting other products. The benefits and risks of relying on international trade to ensure food security for all are at the heart of the debate over these alternative strategies. Discussion of that issue, however, is beyond the scope of this book. The production potential of land is set by soil and climatic conditions and by the level of inputs and management applied to the land. Crop production can be rain-fed or irrigated and can be maximized by matching the climatic and soil attributes of the land with the climatic and soil requirements of the desired crop. Attempts to grow crops that are not suited to the prevailing ecological conditions will often result in low yields or crop failure, with consequent adverse effects on food security. 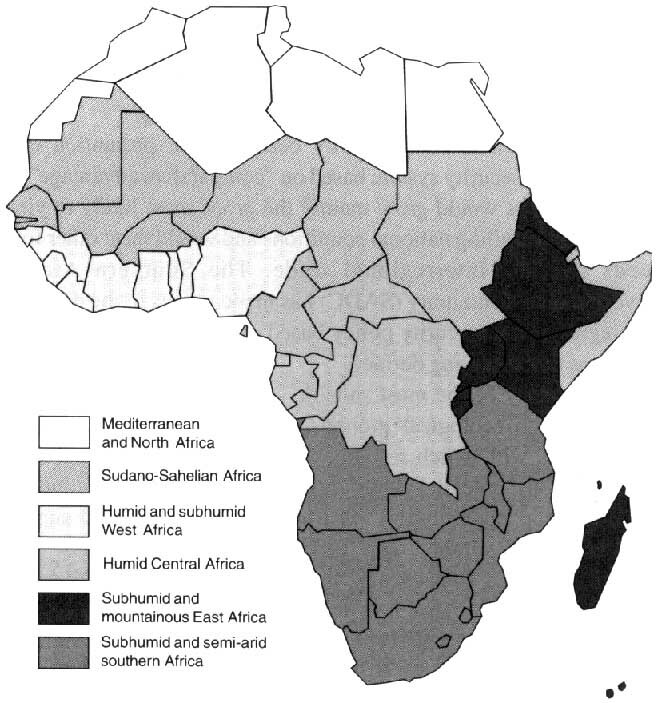 Figure 13 shows the characteristics of the six major climatic zones of Africa. The type, timing and level of inputs also have a major effect on yield. A low level of inputs is associated with subsistence or small-scale production, low capital intensity, manual labour, local cultivars (seed types), little or no fertilization, no pest control and small farm areas. A high level of inputs is associated with commercial production, moderate to high capital inputs, increased mechanization, improved cultivars, the use of inorganic chemical fertilizer and pest control, medium to large landholdings and accessibility to markets. In general, the continent of Africa as a whole is characterized by a low level of inputs. The suitability of land for each crop may be assessed and defined in terms of a percentage range of the maximum yields attainable. Land areas capable of yielding 80 percent or more of the maximum yields attainable are classified as very suitable; areas yielding from 40 to 80 percent of the maximum are suitable; areas yielding from 20 to 40 percent are marginally suitable; and areas yielding less than 20 percent are classified as not suitable. Under the current conditions in Africa, the most extensive area of land (455 million hectares) is suited to the cultivation of cassava, followed by maize (418 million hectares), sweet potato (406 million hectares), soybean (371 million hectares) and sorghum (354 million hectares). In the Sudano-Sahelian region millets are recommended as the primary crop, suitable for the largest area of land, since they require less moisture, while sorghum is dominant in subhumid and semi-arid southern Africa. Maize is to be preferred in terms of suitability for the largest areas in humid and subhumid West Africa and subhumid and mountainous East Africa. In humid Central Africa, the most appropriate crop choice for the widest land area is cassava. Table 13 gives the yield ranges of 11 important crops on land classified by suitability for each crop. The yield differences between very suitable and unsuitable land are substantial. The data also confirm the significant impact of higher levels of inputs on yields. A first approach to food security could be the promotion of a regional1 food security system based on "comparative advantage", in which countries would grow mainly the crops most likely to yield well under prevailing national conditions and would meet other food needs through interregional trade. The Southern African Development Community (SADC) has made moves in the direction of a regional food security policy based on crop specialization, but the issues are still being defined. 1 "Regional" refers to countries in close proximity that share international trade in food commodities. Sorghum may be the most suitable crop to select as the national food staple on ecological grounds, but many farmers and many governments will switch resources to the production of maize for several reasons: potential yields are higher, even if risks of failure are greater; export opportunities exist in the region; technical support packages are available; and maize is easier to process, both commercially and domestically, than sorghum. Risks of failure are greater for maize because it is particularly sensitive to the types of moisture shortfall that are typical in East Africa: delayed onset of the rains, a mid-season dry period and early termination of rainfall. However, sorghum is not without its problems; for example, it is particularly susceptible to attack by seed-eating birds. A strategy of crop specialization that tends towards a narrowing of the food base is risky, especially in areas that are ecologically fragile and those that lack an efficient transport and marketing system to ensure rapid distribution of a variety of different foodstuffs throughout the country. In addition, a food production system in which the main food crop is also the main cash crop, as is the case with maize in eastern and southern Africa, is open to considerable risks, especially for resource-poor subsistence farmers. For these farmers crop failure will mean loss of both income and food for home consumption, as was demonstrated during the drought in southern Africa in 1992/93. In Africa, a large proportion of the population is still dependent on small-scale agriculture for food. Therefore, policies that alter land use and farming systems at the subsistence level have a direct effect on food availability, access and consumption. Traditional systems of land use, farming practices and cropping patterns are all changing as small-scale farmers face growing demands from markets and government to increase productivity. The farmers are required simultaneously to produce a food surplus for urban consumption, to feed and maintain their own households and often to increase their output of selected cash crops for export. These diverse demands often put a considerable strain on the land, labour and time of the farming household. Food security at the household level may be affected by this transition. Traditionally, food production in Africa remained at subsistence level and the farming system was based on shifting cultivation and bush fallow farming. Under these practices, soil fertility was periodically restored to cultivated land by the shifting of cultivation to fresh, rested ground, allowing the recently cultivated land to rest and recover. The use of external inputs such as chemical fertilizers was minimal, with farmers occasionally applying organic manure. Similarly, animal production was practiced as an extensive free-range system in which pastoralists moved with their herds to seek new pastures by following the seasonal rains. Such systems of agriculture were ecologically appropriate and sustainable under low population densities. However, with increasing numbers of people and animals, more settled cropping patterns were established, and the fallow period was gradually reduced. As a result, cultivation practices became more intensive; crop rotation, multiple cropping and intercropping were adopted as effective strategies to maximize land productivity without endangering soil fertility. Land-use patterns were complex, involving the production of a wide variety of food crops for domestic consumption; this strategy ensured a varied diet and helped to stabilize the food supply against climatic and seasonal shortages. Gradual monetization of the economy and a shift in the socioeconomic environment increased the need for cash. For example, there was increased demand for education, better housing, health services and communications. Cash crop production was increasingly adopted by small-scale farmers as they strived to generate cash both for themselves and as foreign exchange for their countries. In most cases, governments adopted the policy of balancing the production of exportable cash crops and food crops. The governments of several countries of eastern and southern Africa identified maize as the most appropriate food and cash crop for small-scale production, and cropping packages already adopted by commercial growers were promoted. However, in many cases there were unforeseen problems, and the maize production of the small-scale farmers failed to meet consumer demand. The transition from subsistence farming to cash crop farming offers the opportunity to increase income, but it also harbours considerable risks. These include the food security risks of increased dependence on a limited number of crops, capital risks linked to prices and socio-economic dependence on the lender when credit is obtained. Poor farmers in particular have often failed to reap the benefits of technological change or commercialization, or have even lost from them. On the whole, cash crop production can be expected to have a positive impact on nutrition when the income it provides more than offsets not only the food production that is foregone, but also any rise in food prices that may result from an increased demand for purchased food and the freeing of prices. Changes in cropping patterns resulting from the transition to commercial production may affect household food security. Traditional farmers have generally adapted food production practices to meet environmental, economic and technological limitations. They minimize risk by planting a variety of staple crops that mature at different times during the year. Monocropping may encourage seasonal shortages; traditional intercropping practices provide a cushion during seasons of insufficient food (see Chapter 5). In many communities, a major staple is grown as both food and cash crop. If there is an efficient marketing organization, this crop will be sold, often by the household head (male or female), as the major cash source for the household. The household will meet its food needs partly by home storage, but also by buying back the main staple as required and/or by growing secondary crops such as millets, sorghum, cassava and sweet potato. These secondary crops are used for various purposes such as home consumption, beer brewing, sale in the informal sector, food for poultry or small livestock, food in case of drought (especially cassava) or informal exchange or barter during the season in return for seeds, small livestock, poultry or other goods. In the Wedza communal area of Zimbabwe, cultivation and consumption patterns are circumscribed to a large extent by the needs of households to earn money and to subsist (see Box 12). A variety of activities are undertaken, including the production of enough food for daily needs, together with a minimal store of food, usually the basic staple, to last at least until the following season. In some cultures, the provision of food for family use is the responsibility of both husband and wife. In other cultures, it is largely the responsibility of women, who may have their own fields specifically for home food production (see Box 13). In the African context, cash crop promotion and commercialization are of particular significance for women. Commercialization has often taken place through expansion of cultivated land rather than through substitution of modern varieties or cash crops on previously cultivated land. Frequently, the overall result of adopting cash crop production has been an increased demand for labour, especially women's labour. Some of the effects of new agricultural technology on women's workload and the shift in control over resources have been well documented (Kumar, 1994). The timing of inputs, including labour, is often crucial to securing maximum yields when hybrid varieties are used; thus not only the quantity of labour but also the seasonal application of labour is important. In many cases, this will result in diversion of labour from other activities, including domestic work, home gardening, child care and regular preparation of well-balanced meals. When adult energy requirements increase, so does food demand, which is likely to be met at the expense of children's food intake. On the other hand, the nutritional status of overworked adult women stands to be compromised if the food available is insufficient to meet their increased body requirements for energy. · engaging whenever possible in informal-sector activities in the form of casual labour (building, thatching, hiring out implements or draught animals) for men, or the selling of vegetables, poultry, pottery or sewing work for women. · the daily food requirements of household members, together with a minimal store of food to last at least until the following season. Traditionally, even today, it is considered the responsibility of women to provide for the daily food needs of household members "from the field to the plate". This has its origins in certain traditional divisions of labour between men and women, with men being the hunters and cattle owners and being responsible for heavy labour such as land clearing and ploughing. As landholders (through usufruct) and cattle owners, men also have controlled the households' most valuable assets. Today, the division is not as strict as it once was, with many women, by force of circumstances, taking on more responsibilities for ploughing, herding and other tasks. Most households reported that women take the main responsibility for the production of most crops in terms of labour and decision-making. In half the survey households, the income accruing from maize sales was said to be received jointly by the husband and wife, and in two-fifths by the wife only. Practically all other crops (excepting sunflower and cotton which are cash crops) are said to be "women's crops". A previous study in Wedza showed that despite this responsibility, men are still key decision-makers when it comes to allocation of land to particular crops, access to loans and control of income accruing from crop sales. Among the survey households, there appeared to be some disagreement over those issues Women in Wedza suggested that they must have access to land in their own right or jointly with their husbands to overcome the disparity. Women have joined farmer groups in large numbers as a way of overcoming some of the constraints they face. Production of cash crops often requires a variety of additional inputs. To increase yields, farmers are encouraged to purchase hybrid or improved seeds in place of their own local varieties saved from the previous harvest. The farmer often requires credit to purchase not only the improved seeds but also the appropriate fertilizers and pesticides. A farmer growing cash crops therefore faces the risk of going into debt, especially if payment for the previous cash crop is delayed. These circumstances may limit the family's cash flow resources and reduce household food security. Despite the potential risks, commercial agriculture can provide opportunities for household food security and nutritional improvement, particularly if it is managed so as to benefit the rural poor. To obtain such benefits it may be necessary to increase the productivity of small-scale farmers through targeted measures such as production incentives, development of marketing infrastructure and more research on rain-fed and other disadvantaged areas. The impact of such programmes can be strikingly enhanced if they are accompanied by effective extension services, farmer education and nutrition education programmes. Programmes to increase production and incomes in enterprises controlled by women can also contribute to the improvement of household food security; many studies have shown that earnings by women are likely to be utilized for increasing family food consumption. However, projects targeted towards women with the goal of income generation need to be sensitive to competing demands on their time - particularly demands generated by child care. A policy for self-sufficiency in food production or adoption of a "food first" policy that emphasizes food crops to the exclusion of cash crops is not necessarily desirable or crucial for alleviating malnutrition, when market infrastructure and transportation do not impede trade. Where market infrastructure is not well developed, it should be strengthened in the long-term interest of achieving food security on a sustainable basis. In the short and medium term, the joint promotion of food crops and cash crops, especially home gardening and small animal rearing, is required in support of food security enhancement. Selling cash crops on the market instead of producing only food crops often increases household income and may thus also be likely to increase food consumption, provided the switch to cash crops does not lead to a change in income control at the household level and consequently to decisions for its disposal that could reduce expenditure on food. Additional employment and income can also be derived from the development of small-scale agro-industries involving post-harvest activities, from cleaning and sorting of crops to storage, processing and marketing of foods and other agricultural crops. This is a key factor both in overall development and in providing income to poorer sectors of the population. Commercialization of agriculture, the development of labour-intensive agro-industries and an active food system, supported by an appropriate policy environment, provide the only way out of subsistence agriculture and allow communities and governments to generate the wealth required to pay for needed social and infrastructural improvements. To ensure that agricultural growth will benefit the poor and to meet the consumption needs of present and future populations, the creation and dissemination of nutrition-enhancing agricultural technologies developed to suit different agro-ecological areas and farmer groups are of major importance. In many humid and subhumid areas, people commonly cultivate compound farms or home gardens, which are sometimes also referred to as backyard or kitchen gardens (Figures 14 and 15). The home garden is only one of several field systems operated by a farmer or farm household (Figure 16), except in urban and pert-urban areas and in areas of land scarcity, where the home garden may be the only cultivated plot. The home garden is thus one of the components of the whole farming system and is under the same household management or subject to related multiple decision-making processes (Okigbo, 1994). The home garden often includes a permanent agricultural plot or forest garden which contains an ecologically balanced mixture of perennial and annual crops. The garden forms a hub' with the homestead at its centre, from which paths lead to other field systems and other production units devoted to annual crops for the market and for home consumption. Source: Asare, Oppong and Twum-Ampofo. 1985. Home gardens are often highly diversified. Crop mixtures found in home gardens are mainly the result of deliberate selection and cultivation of a wide variety of herbs and trees occupying complementary levels and playing supportive roles. The gardens provide farmers with a mixture of food and cash crops (Table 14). Livestock, including sheep, goats, poultry and to some extent cattle and pigs, are also kept, although on a small scale, providing food, income and manure. Mixed tree and herb cropping systems have greatly extended harvesting periods and thus ensure continuous availability of some food. Tree species, once established, require only minimal labour and inputs for maintenance. They provide a continual food supply for years without the need for annual replanting. The biological diversity and complexity of home gardens decline with the transition from the humid to the semi-arid and arid areas of the Sahelian countries. As defined by the International Crops Research Institute for the Semi-Arid Tropics (ICRISAT), semi-arid areas are those where average annual rainfall is 400 to 1 400 mm per year. Precipitation exceeds potential evapotranspiration for two to seven months of the year. Rainfall tends to be erratic, both in timing and areas covered, and this problem is worse in the low-rainfall areas. The dry season is a period of drought, with hot days and warm nights. In some areas, rainfall is less than 30 mm per month for five to seven months of the year. Thus plant growth is limited for a considerable part of the year. Source: Asare. Oppong and Twum-Ampofo, 1985. An increase in land productivity in these areas is essential to reduce the pressure to extend into even more marginal areas, which could provoke further land degradation. As the drylands are characterized by marked seasons, the availability of resources changes through the yearly cycle. Insufficient water is one of the major constraints to successful gardening in dryland areas; however, through effective soil management and cheap and effective solutions for harvesting and storing water, crops can be kept growing through some of the dry periods. Gardens in dryland areas can contribute greatly to the nutritional and economic well-being of households by reducing the level and duration of seasonal food shortages and introducing an increased variety of nutrient-rich foods into the household diet. Boxes 14 and 15 describe some of the gardening principles and suitable plants for home gardens in the semi-arid tropics. As Africa's marginal lands are much greater in area than its fertile rain-fed or irrigable lands, even modest increases in local food supplies in the semi-arid areas could contribute considerably to the food security of the continent. Ecologically the compound farm or home or forest garden, together with animals, forms one of the most sustainable traditional farming systems; it maximizes biological production, protects the soil against erosion and can provide a varied and nutritious diet on a continuous basis, thus ensuring food security at the household level. However, with increasing population density farmers have sometimes adopted farming practices that have led to tree removal, thus enhancing soil erosion and decreasing crop yields and returns to labour. Tree removal has often culminated in serious environmental degradation. Continuing replacement of home gardens and traditional farming systems with row crop production systems has also resulted in increased soil erosion, soil degradation and deterioration of the environment. A garden may surround a house or be located in a family field or in a community gardening area on the edge of, or some distance from, the village. It may be a home garden for one family, an income-generating project for a group of village women or a youth group, a school project or a health centre garden. The following suggestions advocate the use of indigenous design and systems rather than a fixed model. The structure of the garden is adapted to the semi-arid tropical environment. It provides a diversity of foods over a long harvest period. Unlike the neat rows of annual crops characteristic of the industrialized countries in the temperate zone, the mature mixed garden consists of a dense mixture of annual crops and perennial trees. The mixed garden makes maximum use of limited space and maximizes the total yield, even though some of the individual plants would yield more it given more space and sun. It is multi-storied, making full use of the air space with a maximum of trees, bushes, climbing plants on poles or branches, erect and spreading plants and ground-trailing plants. The roots also exploit different levels underground, with some close to the surface and others, including the trees, reaching to the moisture further down. A good design for a mixed garden takes account of the way different plants can share light, air and root space and leave little room for weeds. The multi-storied garden provides "canopy mulch" and protects the soil and the plants from the wind, excessive sun and rain. Soil fertility is increased by composting, mulching and the incorporation of dead plant material, which in turn increases crop production and conserves soil moisture. Leguminous trees and plants build fertility, and companion planting decreases pest buildup. Economically, the mixed garden is a low-capital, high-return cropping system. Local planting materials, if they cannot be stored by the family, are usually available at low cost through trade or purchase. Most crops that are native or have become adapted to the environment over time are relatively resistant to many pests and diseases. These crops are generally less dependent on fertilizer and water than temperate species. The appearance of the garden changes dramatically according to the season. During the rainy season there is an impressive mass of greenery. In the dry season the absence of greenery is noticeable, except for a dark-green mass of trees usually surrounding the home compound, and a small watered area. A larger mixed garden provides an ongoing supply of vegetables and fruits that contribute significant quantities of energy, protein, vitamin A, iron and vitamin C to the family diet. Also the garden, and especially the trees, is an amenity for the household and the surrounding area. Additionally, the complete garden can produce some fuelwood. Increased urbanization and deforestation threaten some edible and useful plants that feature in the home garden but that have remained largely semi-wild and underutilized. An increasing focus on a few major staples such as maize and rice and changes in food habits towards the increased use of convenience foods have narrowed the food base of urban and to some extent also of rural populations. All these factors call for measures to ensure that the full potential of plants found in home and forest gardens be realized through genetic improvement, improved home garden management and better processing and utilization. African food supply systems and types of agricultural production have traditionally inclined largely towards rain-fed cultivation. Additional needed food has come mainly from increasing the area cultivated. However. good land is becoming scarce, and farmers have little choice but to intensify production systems to increase yields per unit of land and per hour of labour input. If food production is to keep up with population growth and dependency on commercial or concessionary imports is to be avoided, production increases of up to 4 percent per year are needed. Attempts are being made to increase crop production in dry areas through more irrigation development schemes. Irrigated agriculture is particularly appropriate for the production of high-value horticultural crops in pert-urban areas, and it can also extend production of other crops such as wheat, rice and barley, which are not easily grown in most of Africa. The physical potential for irrigated crop production in Africa is large. Areas of irrigable land are considerable, and there are large amounts of surplus water that could be used for irrigation. On average, 27 percent of the potential has been realized in continental Africa, but large disparities exist among the regions. North Africa has already realized 79 percent of its potential, but a large amount of potential remains untapped in central African countries, where water resources are relatively abundant. Sub-Saharan Africa, where only 4 percent of arable land is under irrigation, is far from reaching the world average of 18.5 percent. Institutional, economic and social considerations are among the main constraints to an expanded programme of irrigated production, especially for production units under central control such as State farms. Large irrigation schemes tend to be fairly expensive both to initiate and to maintain and should therefore be discussed fully in terms of viability and cost-effectiveness before they are recommended as a strategy to improve food production. Smaller-scale community-supported irrigation systems using locally appropriate technologies, including water harvesting, small pump schemes and inland valley swamp development (locally known as fadema Nigeria and vleis, dambos or mapani in southern Africa), have a large potential for achieving and sustaining needed increases in food production. There are, however, environmental risks associated with irrigation schemes. Waterlogging and soil salinization are major causes of declining yields on irrigated land. Waterlogging may occur if provision of drainage is inadequate. Soil salinity increases because plants extract pure water and most of the salt contained in irrigated water is left behind. Degradation of water resources through the excessive exploitation of groundwater using tubewells is already recognized as a cause of desertification in some countries, especially India (see Box 16). An innovative approach developed in China, called the "four waters concept", has shown that the comprehensive control and supervision of groundwater, surface water, soil moisture and rainfall can prevent salinization and reclaim salinized land (FAO, 1995d). Irrigated agricultural projects, which are expected to increase food supply and thereby to improve the nutritional status of the population, have often been found to have an adverse impact on health. Increased prevalence of schistosomiasis and malaria has been linked with many wafer resource development projects (see Table 15). While there is no doubt that in warm climates the presence of an irrigation system with extended shorelines of reservoirs and canal banks can contribute to a more optimal habitat for the vectors of schistosomiasis and malaria, it has not been determined yet to what extent the irrigation practices per se contribute to the incidence of these diseases. Recent studies indicate that much of the schistosomiasis infection occurs not during the irrigation phase but during contact with impure water, especially when domestic water supply and sanitation are inadequate. The provision of clean water, sanitation, better health care and health education can significantly reduce the incidence of schistosomiasis, as is being demonstrated for example in Egypt, which has been afflicted with schistosomiasis since Pharaonic times. Similarly, studies from India suggest that there is no direct correlation between the annual malaria parasitic index and the presence or absence of malaria. Research indicates that factors other than the mere presence of irrigation water, including poor drainage, may contribute to the spread of vector-borne diseases in irrigation development. More research is needed to gain a better understanding of the complex relationship between agriculture, environment and health (Biswas, 1994). Much of the successful expansion of irrigation in recent decades has come from the exploitation of groundwater using tubewells. They have the advantage of small-scale, low-cost and rapid construction without the loss of fertile land and the destruction of human settlements commonly associated with large-scale, gravity-fed schemes based on reservoirs. The expansion has been very rapid. In India alone, the number of tubewells jumped from nearly 90000 in 1950 to over 12 million in 1990. Behind this success, however, is neglect of the fact that agricultural development based on groundwater is unsustainable when it uses "fossil" water or extraction rates exceed rates of recharge. The rapid expansion of tubewell irrigation has put extreme pressures on what is commonly a static resource because natural rates of recharge are low. Moreover, the problem has been intensified by pressures that are generally some distance from the site of extraction, largely through deforestation in upland watersheds or overgrazing and other forms of land degradation that accelerate runoff and reduce rainfall infiltration. Consequently, water tables are dropping, which is causing a wide range of environmental, economic and social problems. Saline intrusions are becoming a problem in many coastal regions. Overpumping has led to increased investment or operating costs as falling water tables have necessitated deeper wells and greater energy consumption for pumping. In some instances poor farmers without the capital to deepen their wells have had to revert to rain-fed production. In others the necessary adjustments have been too late and the land has been decertified, as in some places in India. 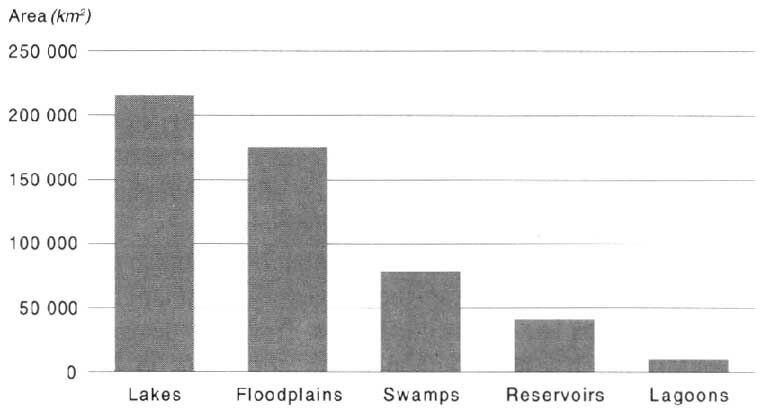 Source: Rosenfield and Bower, 1978. The forest garden or compound farm is a sustainable food supply system under conditions of reliable rainfall, but some climatic zones have little or no potential for rain-fed agriculture. As shown above in Figure 13, populations in the low-rainfall areas of the Sahara, the Sahel and the semi-arid Sudano-Sahelian zone have food supply systems very different from those of cultivators in the humid zone and encounter numerous problems that are critical to their nutritional well-being (Box 17). A threat to the food supply system of pastoralists arises as agriculture extends into more marginal zones. Seasonal pastures are destroyed, and land fertility is rapidly lost in fragile soils. Erosion and permanent environmental damage often follow. A Fulani "noble" family of six lives in round huts built of dried stalks, which when new are rain-resistant. They have a herd of 24 cattle and ten goats; during the rainy season they grow a millet crop. During the wet season they camp around rain-filled ponds, which dry out by November, when the young men, in cooperative groups from several households, leave with the main herd in search of better pastures. The remainder of the household, with their goats, weaker animals and some milk cows, camp during the cold dry season (November to February) on the edge of a village, buying or bartering for cistern water; during the hot dry season they move to camp around a well. The adult men are responsible for the main herd and for most of the millet cultivation, especially weeding. Boys tend the goats and calves. The women and girls collect fuel and water for domestic use, help with the harvest, pound millet and also prepare meals. The household's maximum dietary energy intake in October, after the harvest, is 14 700 kcal per day (65 percent from millet, 35 percent from milk); 9 105 kcal would cover the children's total requirements and allow the adults to maintain their body weights if they did no work, leaving 5 595 kcal for the adults' activities and weight gain. However, from December to June their intake is only from 7 840 to 8 820 kcal per day (9 to 20 percept from milk), so that the family is in a negative energy balance. During the rainy season they supplement their diet with gathered food. Their intake in June/July is from 9 996 to 10 740 kcal per day (43 to 50 percent millet, 8 to 12 percent milk and 42 to 45 percent gathered food). The man and the woman (172 and 163 cm tall, respectively) are at their heaviest in November/December, when they weigh 55.3 and 49.6 kg, respectively; the post-harvest period of abundant food and little work allowed them to gain 2.3 and 0.7 kg, respectively, since July/August. During the dry season, decreasing food and increasing distances to walk for water and pasture cause weight losses of 2.2 and 1.5 kg, respectively, by May/ June. Despite increased intakes during the rainy season, the labour demands of millet cultivation prevent their regaining weight until after the harvest. The weight changes of the four children, aged 5 to 12 years, between July/August and November/December range from +0.6 to +1.5 kg; from November/December to July/August they range from -0.7 to +0.5 kg. Despite their poor growth during the dry season, their weight rarely falls below 80 percent of the standard for their height. Households with sufficient milk or grain for barter during the dry season are able to reduce livestock sales and their dependence on the market, but if a family's food supply runs out during the hot dry season, they may be forced to sell off young livestock below their full value. Livestock sales accounted for 93 percent of the family's 1982/83 cash income; 68 percent of their total income was from barter of cereals and 5 percent from barter of milk products. Some 50 percent of the family's cash expenditures went to purchases of cereals, and of their expenditures in kind 55 percent were for milk products. Recently the situation has worsened because of deteriorating terms of trade resulting from poor rainfall. A prime steer that in 1982 was worth the equivalent of 1 300 kg of millet was worth only 520 kg a year later, grain prices having doubled while livestock prices fell. In 1973, after five years of drought, grain prices soared to nearly 1 000 Malian francs per kilogram [426 MF = US$1 at 1 July 1973], while the emaciated livestock fetched only one-sixth to one-twelfth of their pre-drought prices. In that year alone, an estimated 100000 people died, as did 40 to 60 percent of the livestock. Many pastoralists, forced to sell their animals, were reduced to dependence. Currently, while the majority have rebuilt their herds sufficiently to return to pastoralism, some have never regained former herd sizes and so are in a weaker market position, while others work as paid herders, tending animals bought cheaply by profiteers during the drought. To improve the sustainability of food production systems that are under stress from both pastoralists and shifting cultivators, it may also be necessary to practice agroforestry and mulching in a more intensive manner. Permanent vegetation could reduce the erosion risk by providing ground cover, helping to conserve water resources through mulching, increasing the organic content of the soil and assisting in recycling of nutrients. Strip-planted Acacia and Leucaena species, members of the family Mimosoideae, would provide both mulch and fodder and also enrich the soil through their nitrogen-fixing properties. A food supply system containing these elements, incorporating permanent tree crops, annuals and animals, is traditional in parts of the Sudano-Sahelian zone of West Africa. It is ecologically more stable and offers greater nutritional security than less diversified systems. In Botswana and Swaziland, unmanaged natural bushlands and/or grasslands are set aside by law as community grazing lands for livestock, particularly cattle, which form a central and integral part of the farming systems. These grazing lands are used to provide both fodder and fuel, for which the need becomes acute during the cold winter season. An efficient silvipastoral system, combined with controlled rotational grazing, could usefully complement the existing practice. 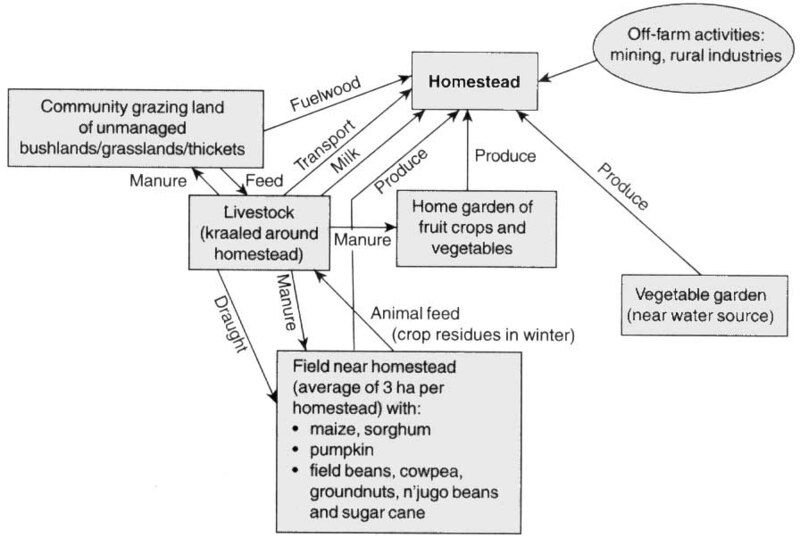 Figure 17 shows some of the interrelationships in a typical animal-based cropping system in Swaziland. However, effective as they were in the past, these systems are deteriorating because of rising demands on them by a growing population and because livestock are increasingly passing out of the hands of experienced pastoralists into those of farmers and investors with inadequate experience in livestock management. Research and extension are doing little to discourage this trend and continue to underrate the effectiveness of traditional systems and the potential productivity of the natural resources. It should be emphasized that solutions are more likely to be found in the support of transhumance and arable systems through better use of fertilizers, legume fodders and cash crops than through digging of wells, veterinary services and protection of grazing lands. Unfortunately, however, the underlying socio-economic conditions are not favourable for such solutions because of the sometimes acrimonious relationship between pastoralists and farmers. There is also an increasing need for techniques to supply feed at affordable costs to farmers in sedentary animal production systems. The most important sources are crop residues from arable fields and roughage from adjacent non-cropped areas. Both could be managed more efficiently but would require external inputs to increase production. Although grain is the most important part of the cereal plant for human consumption, the straw may be equally important for maintaining livestock production. This should be kept in mind in breeding programmes aimed at systems involving both crops and livestock, as in the barley breeding programme at the International Centre for Agricultural Research in the Dry Areas (ICARDA), for example. Livestock and their products contribute about 19 percent to the total value of the production of agriculture, forestry and fisheries in sub-Saharan Africa. However, this figure underestimates the substantial contribution that livestock frequently make to crop production through draught power and manure. Ten countries account for 70 percent of the value of animal production, and five countries, i.e. Ethiopia, Kenya, Nigeria, the Sudan and the United Republic of Tanzania, account for one-half. Table 16 shows the population of selected livestock in sub-Saharan Africa in 1994. Animal products, especially meat and milk, are highly income-elastic products, i.e. their consumption increases with incomes and urbanization. On average, meat and meat products make up only 3.2 percent of dietary energy supply (DES) in sub-Saharan Africa. However, in some countries the contribution of meat and meat products to DES is much higher. Milk is scarcely consumed, providing on average 2.5 percent of DES, except among pastoral populations where milk can contribute up to one-half of total dietary energy intake (see section on composition of African diets in Chapter 7). The value of dietary animal protein goes beyond its proportional content in the diet. The consumption of even small amounts of animal protein improves the protein quality of predominantly cereal diets and thus the utilization of total dietary protein. Animals also make an indirect contribution to human nutrition in sub-Saharan Africa. Cattle are the primary source of the cash income that pastoralists use to buy foodgrains. Among sedentary farming populations, livestock enhance the economic viability and sustainability of farming systems. They diversify production and management options, increase total farm production and income, provide year-round employment and provide insurance in times of need. Livestock often form the major capital reserve of both farming and pastoral nomadic households. The land area of Africa is the principal food supply source for crop and livestock products; the rivers, lakes and waters around Africa also have a role in the continent's food supply systems by providing fish. Fish and fishery products provide on average 3.8 percent of total dietary protein supply in sub-Saharan Africa. Figure 18 shows the surface areas of some water systems of the African continent. Table 17 is a food balance sheet for fish and fishery products of African countries for the period 1988 to 1990. Fisheries have an important role in food production, income generation and provision of employment. According to the International Centre for Living Aquatic Resources Management (ICLARM), the number of full-time fishermen in sub-Saharan Africa totals approximately 1.5 million. In addition, there are many millions of part-time fishermen. Aquaculture differs from capture fisheries just as agriculture does from hunting and gathering. The potential impact of aquaculture on household food security is summarized in Table 18. More detailed information on the potential role of fish ponds in improving household nutrition is provided in Chapter 5.
a Inputs refers to fingerlings or other fish for initial stocking, compost. manure, fertilizer and feed according to type of fish farming practiced. Although there is still considerable potential for increasing the fish catch from inland waters in Africa, in many situations there are so many fishermen that they are not able to make a decent living from fishing. Poverty becomes a major cause of nutritional stress in such communities. A further problem is created by modern foreign trawlers which compete with the national fishing industry in some coastal waters and provide little or no benefit to the local communities or to the national economy. The rapidly increasing rate of urbanization (5 percent in sub-Saharan Africa) is one of the most striking demographic features of the last half of the twentieth century. Urbanization influences all aspects of food production and consumption. Urbanization is an inevitable consequence of socio-economic development, but in many countries it is proceeding at such a fast rate that it is outpacing the growth of services and employment. The result is mushrooming slums in city centres and shanty towns on their peripheries. Under such conditions the supply of potable water for cooking and washing is limited, and facilities for sewage and waste disposal are inadequate or often lacking altogether. Housing is no longer provided through communal and self-help construction, but is another matter for commerce, as rents must be paid even for a space on the floor in a single room. Such housing often lacks facilities for meal preparation. Wage employment and monetary income are the objectives for all physically active members of the family. If jobs in the formal sector are insecure or hard to come by, work might be found in the informal-sector activities of petty trading, repair and maintenance services and food vending. However, the majority of urban dwellers in developing countries remain highly disadvantaged, with very limited purchasing power. For these people, guaranteeing the efficient distribution of low-cost but nutritious food is becoming an ever more pressing concern. Some of the factors affecting household food and nutrition security in urban areas are related to policies and interventions already discussed in relation to rural areas. Such common factors include economic entitlement, price and income policies, employment opportunities and wages, and food or income transfer. The overall availability of food supplies at the national level will also have a major effect on the sustainability of adequate nutrition in the cities. However, a number of other aspects are of greater significance in urban than in rural areas. The most obvious is the necessity to purchase most of the food needed by the household and the consequently greater dependence on the market system and on commercially processed food products. With rapid urbanization, food processing and food marketing must be particularly emphasized. It is estimated that 47.5 percent of the population of developing countries will live in towns and cities by the year 2010 (UN, 1994b). A population shift of this magnitude demands increased agricultural productivity, improved transportation, processing and marketing facilities and a modern food control infrastructure to maintain the nutritional quality of food and to ensure consumer confidence in the food supply. Transport facilities are often insufficient to bring food produced in market or home gardens to markets; this inadequacy contributes to food losses and to reducing the stimulus for farmers to increase production. An effective marketing system is needed for distribution and for reduction and minimization of loss of fresh or processed food through the wholesale chain to the retail shops. The marketing system includes all aspects of food control, quality assurance and inspection to guarantee the quality and safety of the foods to the consumer (see also Figure 11, in Chapter 3). Urbanization usually involves varying degrees of modernization and westernization, which may influence dietary habits and consumption patterns. A shift away from starchy roots and coarse grains to wheat and rice is a common and irreversible trend associated with urbanization of populations that traditionally consumed the former staples. Table 19 shows supply-derived estimates of cereal consumption for Senegal, disaggregated between urban and rural areas. The predominance of rice, followed by wheat, in the Senegalese urban sector is obvious, whereas in rural areas consumption of wheat is almost negligible and the diet is dominated by millet and sorghum products. Table 20 shows that in Côte d'Ivoire there has been an urban swing away from the consumption of traditional starchy staples such as yam and cassava, towards processed and convenience products such as attiéké, a dish of cassava couscous, and plantains, often sold in cities as a snack food of fried plantain chips. A major reason for the shift away from traditional staple foods is convenience. For example, white rice cooks easily and quickly, and wheat products, particularly bread, offer important advantages to consumers who have to travel to work on public transport and usually eat their midday meal away from home, in the form of snack foods or sandwiches. The tendency for certain urban consumers to move away from local food has a potentially adverse effect on rural production, since urban food demand should provide increased markets for domestic production. Agricultural extension services, food technologists and mass media educational services all have an important role to play in linking urban consumer demand to local food production and processing. The shift towards convenience foods reflects another of the major changes in food demand patterns that accompany urbanization. Whereas rural households prepare and eat most of their meals within the domestic domain of house and farm, many urban households consume at least one meal a day, and often two, outside the home. Even in households where cooking space is available, the continually rising cost of fuel has made daily cooking too expensive for some urban families. Male members of such households often prefer to purchase their meals outside the home, where economies of scale may bring down the price of a serving below the cost of home production. Table 21 shows the amount of food prepared outside the home relative to total food consumed by households in Côte d'Ivoire. It was estimated that food eaten outside the home accounted for 23 percent of the average food budget for urban households in Abidjan in 1979 (Delisle, 1989). Much of this expenditure would have involved the purchase of street foods. The expansion of the street food trade has been largely a result of the substantial demand for ready prepared food by schoolchildren, urban workers and homemakers, who have limited time and often live in housing where cooking is difficult because of overcrowding and poor sanitation. This need has been recognized and met by the growing number of urban unemployed or underemployed, who have found a livelihood in informal street food activity. In 1987, Abidjan had nearly 12 500 mobile street food outlets in addition to approximately 1300 maquis, restobârs and stalls also serving snack meals (Delisle, 1989). One of the most universal locations for street food vendors is outside the gates of urban schools and colleges. Not only is there a sizeable demand for street foods among children, in some countries this food comprises an important part of the students' daily diet. Some advantages of the street foods are listed in Box 18. The street food sector contributes to the maintenance of food traditions by offering local dishes, particularly those that are infrequently prepared in urban households. The sector provides a valuable service for urban consumers and a source of cash income for vendors, many of whom are women. However, it also spreads various socio-cultural changes in food habits, introducing behaviours such as eating alone, snacking and replacing meals by "fast food". In addition, problems of hygiene and food safety are bound to arise under the insanitary conditions of the shanty towns and slums where the poorest groups live. The power behind the existence of street foods lies in the benefits derived from the trade by the vendors and clients and the anticipated contribution to the local economies. However, general observation yields the following non-exhaustive list of advantages of the street food trade. · It provides affordable food, conveniently made, available when wanted (time) and where required (place). · It offers employment to educationally less advantaged members of the community. · It offers a nutritionally balanced diet which is sufficient in quality and presents options for variety of choice. · The traditional ways of cooking different dishes preserve cultural heritage and give pride to ethnicity. · The street food trade offers an assured market for local agricultural products, thus encouraging more production and contributing to the local economy. · The trade provides for an economic system in family circles because of division of labour among the family members, i.e. in buying raw foods, preparation, cooking, serving, utensil cleaning and above all management of the trade. · The street food trade offers employment opportunities to school leavers who are attracted by wages which are often higher than government minimum wages. · The business demonstrates the dynamic role of women as planners, managers and bread-earners as well as employers. Source: Adapted from FAO, 1992a. Food industries are a relatively new commercial area in Africa. Their development has been based in part on concepts of added value, fostering processing of primary commodities that are traded internationally such as tea, coffee and cocoa, and of import substitution, fostering production of fruit juices, soft drinks and beer. Other large-scale food industries are the milling industry, producing cereal flours, and the oilseed milling and extraction industry, making refined edible oils and fats from locally produced oilseeds. Rural processing plants, including flour and oil mills, are increasingly being established in many countries. They contribute to the much greater availability of basic processed food items (e.g. milled flour and vegetable oil) for local purchase and sale, and they help to reduce women's workload. Small-scale, community-based food processing plants are as important as large-scale food industries in preserving food quality, preventing food losses and providing employment and increased family incomes. In addition to the basic processing industries, a number of multinational food companies have started to finance local subsidiary companies to manufacture their products under licence. These companies produce a variety of consumer goods ranging from breakfast cereals to instant coffee, dried milk powder, weaning foods, chutneys, sauces and pickles. Thus the range and choice of food commodities tend to be wider in the urban areas. However, many of these commercial products, especially the cooking oils and fats, tend to be priced beyond the means of the urban poor, who are dependent on urban and pert-urban markets for most of their food requirements. The purchased food is supplemented by the little food they can grow in the limited space available, by gifts from visiting rural relatives or by any food they can acquire during visits once or twice a year to their home village. More market research is no doubt needed for food technology development, with particular reference to urban consumers' perceptions, attitudes, preferences, wants, means and behaviours regarding food. Such research could lead to the commercial development of convenient versions of some traditional foods or dishes, which might stimulate the consumption of local foods by urban consumers. Examples of such foods already developed in West Africa include instant yam (a dried, reconstitutable yam powder intended to simulate pounded yam) and gari (a fermented, dried, granular cassava product, used to prepare a sticky, starchy paste called eba). Development of such products can strengthen rural/ urban economic links by enhancing demand for the production of traditional foods in rural areas and by reducing urban dependence on food imports of cereals such as wheat and rice. National research organizations, which include universities, research institutes and the national agricultural research centres, have made tremendous achievements in agricultural research and added substantially to some of the successes that have contributed to increased and more diversified food production. Notable achievements include the development of hybrid seeds to suit different ecological zones, as has been done for maize in Kenya, and integrated pest control measures. Currently, however, most national agricultural research systems face many financial and operational problems. Diminishing resources over the years have led to a severely curtailed level of research output and a severe brain drain of well-trained scientists either to the industrialized countries in the West or to better-paying regional, international or private-sector organizations. Those scientists who choose to stay are often not fully utilized for lack of adequate funding and are usually not well motivated to produce much, even if there is a possibility to do so. Another long-standing problem has to do with the dissemination of research findings. There is reason to believe that much of the earlier research work which generated relevant data is still confined within the agricultural research institutions, while extension workers continue to impart outdated information and inappropriate messages to farmers. Few countries have formalized links between researchers, extension workers and farmers. This situation is cause for worry and needs to be addressed immediately. National research organizations have a mandate to focus their research activities within the national agricultural research agenda. The enormity of this responsibility is such that these organizations cannot achieve much on their own. They should therefore, as some of them have already done, work in close collaboration with the international agricultural research system. They should also establish and strengthen links with the local farmer and extension systems, consumer groups and the private sector within their countries in order to foster more effective communication and to devise ways of managing available resources both maximally and efficiently. The most effective way of passing on the knowledge engendered by research to farmers is by involving farmers as partners in the whole research process from the start, including the setting of research priorities and appropriate institutional arrangements, to ensure that farmers continue to be heard. Extension workers should also be involved in this process. Close interaction with farmers can also give research scientists an opportunity to gain useful knowledge, for example, regarding viable traditional farming systems and practices. The SADC countries, working closely with ICRISAT's regional office in Bulawayo, Zimbabwe, have demonstrated that this kind of collaboration is feasible and highly effective. The 16 international agricultural research centres of the Consultative Group on International Agricultural Research (CGIAR) fully recognize the strengths and limitations of many aspects of the traditional food production systems. They are actively contributing to research on the development of improved systems to optimize productivity, to ensure sustainability and to maximize the efficiency of utilization of inputs, within the constraints of smaller producers. A number of agricultural research centres have an active role in Africa. The International Institute of Tropical Agriculture (IITA) in Nigeria has been involved for many years in developing methods of soil mulching and mixed cropping, as well as in screening woody perennials for their potential use in agroforestry systems such as alley farming. The potential of this system for sustainable production of crops and small ruminants in the humid and subhumid tropics has been clearly demonstrated by IITA in collaboration with the International Livestock Research Institute (ILRI), which has offices in Nairobi, Kenya and Addis Ababa, Ethiopia. However, its implementation on a large scale awaits further research into socioeconomic aspects. In the semi-arid tropics, ICRISAT in Harare, Zimbabwe has made notable progress with new systems of management of small watersheds, management of vertisols during the rainy season and various systems of intercropping. ICARDA in Aleppo, Syria has shown how production can be sustained in the dry regions of the Near East and North Africa through the application of relatively small amounts of phosphate in production systems that integrate cereal, livestock and legume production (Cooper et al., 1987). While not itself a research institution, the International Center for Research in Agroforestry (ICRAF), based in Nairobi, Kenya, promotes research on production systems incorporating woody perennials, particularly in relation to their potential for sustaining crop and animal productivity. The centre is taking the lead in streamlining terminology and developing methodology for research in agroforestry. ICRAF suggests that in the process of intensifying land use, trees can have both an ecological role (for example, in fertility maintenance and erosion control) and an economic role (for example, in increasing income through sale of tree products). Research should strive to maximize productivity with low levels of inputs, consistent with the requirements of sustainability. Research centres need to recognize that control of soil erosion is a vital component of sustainable agriculture, and they must try to refocus their research agendas accordingly. All over Africa, the traditional food supply systems involving shifting cultivation are disappearing as population pressure results in shorter fallow periods, which lead to inadequately regenerated soil, to reduced crop yields and ultimately to food shortages and hunger. The problem with low-input agriculture is its inability to return to the soil a fair proportion of the nutrients that have been extracted by crops. If the low input level of traditional agriculture continues under these circumstances, the food supply systems will be crippled in a number of African countries to a point where they will be unable to feed their fast-growing populations. To restore soil fertility, higher inputs become necessary. The aim of research should therefore be to promote an evolution towards greater productivity from balanced systems, with maintenance of low levels of purchased inputs, as farmers are often unable to afford high input levels on a sustainable basis. An urgent need under low-input conditions is to alleviate soil degradation and prevent further erosion. Techniques are required that can give the farmer immediate benefit while also contributing to long-term sustainability. The use of animal manure and fertilizers is crucial in this respect, but other methods can also be introduced. For example, establishment of grass strips can provide dual benefit, protecting the soil from erosion and providing reserves of fodder for use at critical times of the year. Also, in some environments, legumes might be grown for both short- and long-term benefits. For example, it might be possible to grow a leguminous crop with applied rock phosphate on residual moisture after the main crop has been harvested. The farmer could thus obtain fodder for use in the dry season, while the fertility of the soil would improve from animal manure and decomposing legume roots. Because many farmers do not have access to purchased inputs, cannot afford them or do not use them for fear of economic losses, the research centres have recognized the importance of research both to alleviate the constraints and to benefit resource-poor farmers, especially those in less favourable environments. Their endeavours include programmes to develop crop varieties that are resistant to pests and tolerant of environmental stresses such as drought, salinity and aluminium toxicity or that exploit limited soil resources more effectively through better root systems or through association with mycorrhiza. Agricultural research and related policies offer great opportunities for long-term nutritional improvement. They can improve the income of poor farmers and agricultural workers and reduce the unit costs of production, thus reducing food prices for low-income consumers. For full realization of the opportunities, nutritional issues must be considered explicitly in the planning of agricultural research. Research for agricultural production influences human nutrition in many ways, for example, through effects on: household incomes of families at risk of having undernourished members; prices of the food commodities; production systems of subsistence farmers; risks of fluctuation in food production, prices and income; nutrient composition of foods available to households experiencing malnutrition; household income, intrahousehold income and budget control; time allocation of women; and demand for labour. · the development of agronomic methods to improve the bioavailable micronutrient content of major crops, including staples, with such efforts directed towards crops that are widely consumed. The development of research in these priority areas will call for comprehensive consideration of specific food systems and for the active collaboration of researchers from several disciplines, often with the participation of local families.